After playing countless gigs, you start to hear the same comments or questions over and over again; not to mention the same song requests. One question that always makes me laugh is "What kind of guitar is that?" While some of the folks who ask this question are truly asking to better their knowledge of good sounding brands in the Classical Guitar world, most are just on a misguided search for something that will make them sound better without having to practice. 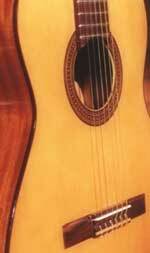 Almost always I do gigs on a cheap Japanese Classical Guitar called an "Aria". Anyone who knows guitars would know that this guitar is nothing special. I put a great pick up in it and I have the best sound equipment so compared to most amplified classical guitarists I sound above average. In addition I play with very good tone production which includes filing the nails properly and years of practicing technique correctly. So when someone asks "What kind of guitar is that? ", I respond by saying that's a cheap Japanese classical guitar I picked up used for $100 bucks. It always throws them off guard. They are always expecting to hear that I searched the mountains of Spain for the ultimate orgasmic guitar. Furthermore the best Spanish guitar on earth wouldn't sound much better amplified, and may in fact sound worse than my current set up. While I would much rather be playing a fine hand made Spanish or American guitar to a quiet audience, I will continue to play my cheap guitar with the pick up when I need to be amplified. One of these days when someone comes up to me and asks that predictable question I just may say I traveled to Spain on a freighter, hitch hiked to Cordoba and met an old man in a little shop next to a brothel. There he heard me play and gave me the guitar for free. I cherish this guitar and sleep with it next to my bed every night. The old man died and there are very few in existence; it is called a "Pretendito".